Josh and Rebecca Unfried created Mom Faves as a platform for word of mouth to go to a whole new level. It gives moms an opportunity to share about what they love and what works for them.? This in turn helps other mothers around the country to make good decisions concerning products, websites, stores, restaurants, events, and so much more. The site’s content is created BY MOMS and FOR MOMS.? It helps moms to have a content source and be able to research without it taking hours.? Everything is on one site. All you need to do to is register and then share your top picks in a wide variety of categories.? You can then choose your favorites and “Fave It.”? Once you check out the site, you will understand.? 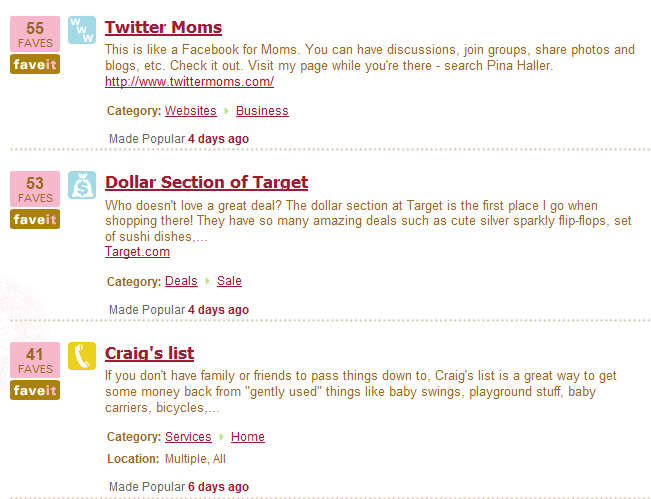 If your favorite isn’t listed, you can add it to the site and watch as other moms promote that product by choosing to “Fave It” as well! MomFaves.com was inspired by the memory of Josh Unfried’s mother, an outgoing teacher who loved nothing more than to share what she loved with her friends and family.? Josh created Mom Faves to facilitate this sharing between moms around the country. Mom Faves was incorporated on October 29th, the third anniversary of his mother’s death, and will be launched officially this Wednesday, on what would have been her 57th birthday. Check out the story behind Mom Faves – it is very touching! Norma Unfried loved parties, and the Unfrieds asked that we celebrate the site launch with a SiteWarming Party on Twitter this Friday, February 13th from 9 to 10 p.m. EST (#momfaves). And of course there will be door prizes and a fabulous Goody Bag contest with lots of fave-worthy products! I so already set up profile there and listed some of my fave sites 😉 Are you on there? I think my username is brandyellen just like on twitter 🙂 Looks like a fantastic site!!! Wow! What a compliment this review was for both Rebecca and I. Thank you so much for capturing and sharing the heart behind the site. We look forward to seeing you (and all your readers) sharing your favorites with us. The launch is going really well – how could it not with reviews like this, and from such a great blog. Thank you for including us in your post!